Dried mushrooms are a concentration of flavours and smells. With the traditional drying process used in our laboratories, the flavour and aroma of the mushrooms are exalted and maintained over time. Maybe not everyone knows that from 1 kg of fresh mushrooms you obtain approximately 100 grams of dried mushrooms! “Extra” which has almost perfect slices of a light colour tending towards white, for the most part whole. “Special” that has slices of a slightly darker colour, not always whole. And lastly “commercial” that has decidedly dark slices tending towards brown, and mainly broken pieces. The categories don’t necessarily represent the scale of taste. A product made from pieces broken during the preparation phase can be easily just as tasty and fragrant as one that appears whole to the eye. And vice versa a “nice looking” product is not automatically the tastiest! 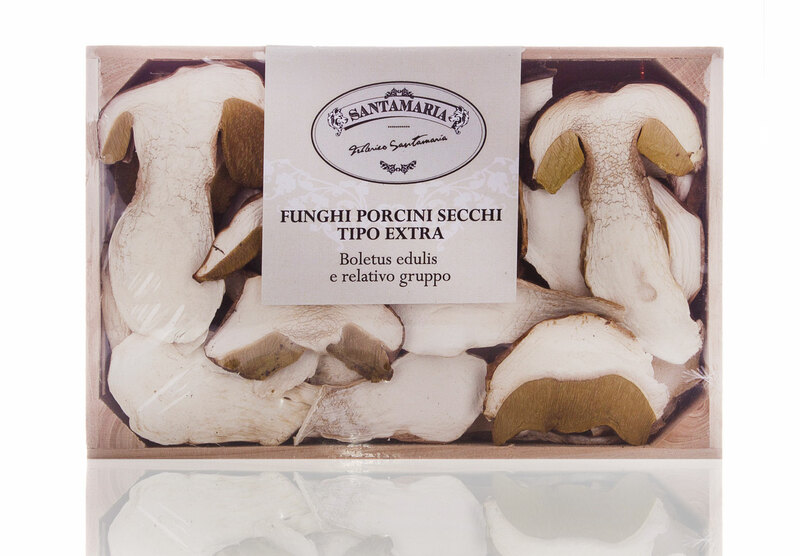 Dried porcini mushrooms are an important ingredient in traditional Italian cooking, as the main ingredient in risottos, sauces, meat dishes and vegetable side dishes and even with fish. The best way of maintaining the product is in a freezer bag in the freezer. Before being used the product should be soaked for 10-15 minutes in warm water. Once filtered the water can be used in the cooking process. To see the different formats and weights available download the catalogue.